New Delhi: In a bid to thwart a rebellion in the party, Karnataka Congress shifted its MLAs to the Eagleton resort in the outskirts of Bengaluru on Friday. The move comes soon after four dissident MLAs (Ramesh Jarkiholi, B Nagendra, Umesh Jadhav and Mahesh Kumathahalli) skipped the Congress Legislature Party (CLP) meeting, that was called as a ‘show of strength’ against an alleged bid by the BJP to topple the seven-month old HD Kumaraswamy-led Karnataka government. 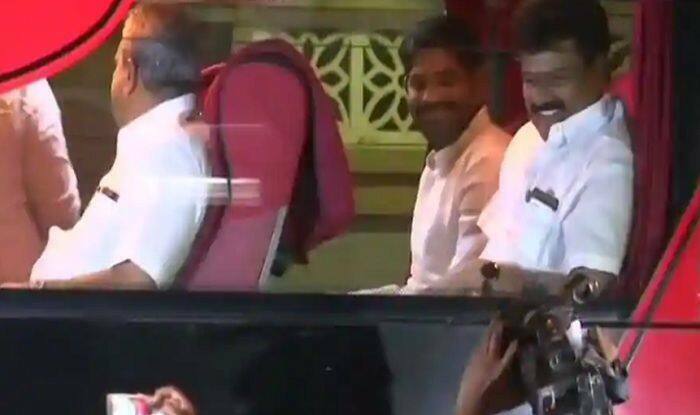 The Congress MLAs were reportedly herded together in two buses from the Vidhana Soudha, the state secretariat where the CLP was held, and taken to the resort. A state senior Congress leader said since it was suspected that eight party MLAs had ‘committed’ to BJP and might jump ship, the legislators were being shifted to a resort. “Fearing humiliating defeat in the Lok Sabha elections, they are trying to dislodge our government. If Congress and JDS fight together, BJP will not get more than 3-4 Lok Sabha seats from Karnataka,” the former Karnataka CM claimed. Furthermore he alleged that the BJP is offering up to Rs 100 Crore to his party’s MLAs. “To escape the onslaught of the BJP, and as a pre-emptive measure, we will do that,” said Siddaramaiah, while justifying the move. “All the MLAs, MPs, and ministers will stay together. They will stay together as long as required to escape from the onslaught of the BJP,” Siddaramaiah said, adding that they would also discuss Lok Sabha elections. Reacting over this, BJP state president BS Yeddyurappa in his brief statement to media said that the absence of four MLAs from the CLP meeting clearly showed that all is not well in Congress. He also stated that the Congress-JD(S) has lost moral right to rule. Meanwhile, BJP MLAs continued to stay put at a luxury hotel in Gurugram, a move the party has defended saying it was to prevent the Congress from poaching them. It is still not known when the MLAs, hunkered down since Monday when the turmoil erupted, would return home.